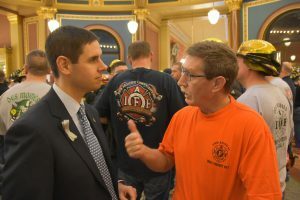 The Iowa Public Employment Relations Act (often called Chapter 20 or Iowa’s collective bargaining law) was passed with bipartisan support and signed into law by Republican Governor Bob Ray in 1974. The law lays out the rules by which public workers and state/local government employers sit down and solve problems. 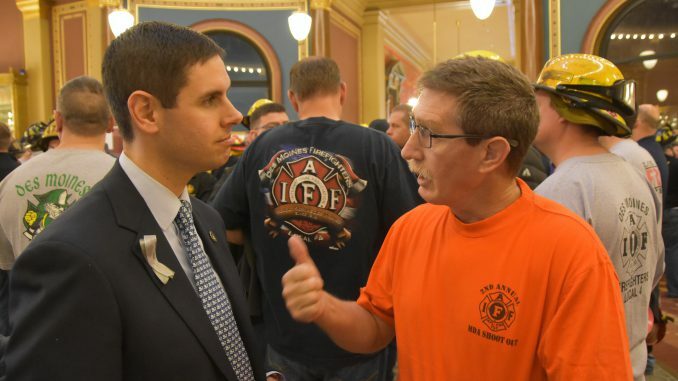 KEY FACT: Iowa’s collective bargaining law also prevents public workers from striking, which is one of the reasons the law was passed. Permissive. Both sides have to agree to negotiate on the topic. There is a long list of public employer rights listed in the law, which includes hiring, promotion, demotion or transfer of employees; suspension or discharge of public employees for proper cause; and maintaining the efficiency of governmental operations. In most cases, the two sides are able to sit down and negotiate on mutually agreed upon contract terms. In the rare instance (less than 3% last year) when the two sides cannot reach agreement, they can pursue mediation and/or arbitration. KEY FACT: The vast majority of public sectors contracts are resolved voluntarily. During the last bargaining cycle (FY 2016), 97.9% of contracts were resolved voluntarily. During mediation, an impartial neutral party helps facilitate dialogue between the employees and employer. This helps the two parties reach a resolution. During arbitration, the two parties have reached an impasse and submit their differences to a third party arbitrator. When making a decision, the law lays out the factors the arbitrator must consider, including: past contracts; comparisons with other public workers doing the same work; interests and welfare of the public (taxpayers); power of the public employer to levy taxes and appropriate funds. The arbitrator then determines which offer is the most reasonable and the decision is final and binding. This process forces both sides to have reasonable offers, not the extreme.